While not inherently unsafe, MnDOT’s fracture-critical bridges — those having critical, nonredundant components — must be inspected on a regular basis. To help track the health of these bridges, MnDOT has developed a bridge health monitoring system that uses electronic instrumentation to provide advance warning of structural distress. The system detects acoustic emissions — stress waves caused when cracks form and propagate in the steel components of a bridge. Researchers recently deployed and tested the system on the Cedar Avenue/Highway 77 Bridge in Burnsville, enabling them to develop procedures for automatically collecting and processing data. “Ever since the collapse of the I-35W bridge in Minnesota, many states have been interested in developing a bridge health monitoring system that will help engineers address the many challenges of managing infrastructure and ensure the longevity and safety of our bridges,” said Moises Dimaculangan, MnDOT bridge rating engineer. To help distinguish real monitoring events from false alarms, researchers conducted tests to capture acoustic emission data caused by brittle fractures in steel beams using the same bridge health monitoring system currently being used at the Cedar Avenue Bridge. MnDOT will continue to use the system to monitor the Cedar Avenue Bridge, a steel tier-arched bridge over the Minnesota River. It was chosen because it is fracture-critical, but has no history of cracking. The test deployment also led to guidelines for monitoring other fracture-critical bridges. 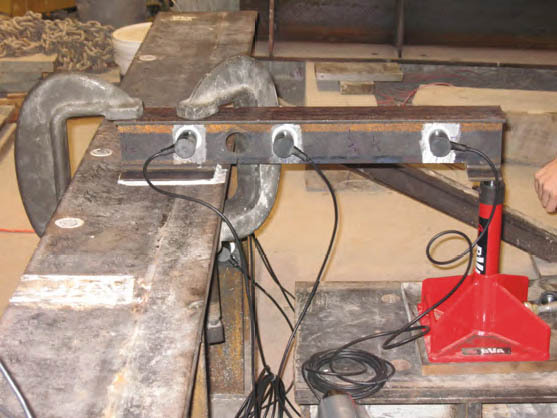 University of Minnesota researchers recommend further investigation into acoustic emission data analysis methods, as well as using the system developed in this project to monitor another steel bridge, one with a history of cracking. *Note: This article was adapted from the upcoming May–June 2014 issue of our Accelerator newsletter. Sign up today to receive your free print edition or to receive email notification when new issues become available online. Subscribe here.